One good shed deserves another…that’s what we’re saying after a couple of Steeltech Sheds installations in Carlow recently. We could also say that just as everybody needs good neighbours, good neighbours need good sheds. That’s because these two installations were actually for next-door neighbours. We put the first in a few months ago. It was a 7 metre by 3 metre Steeltech Shed, that sits very well alongside an old stone building in the customer’s garden. The owner is using it for general storage, and it’s serving him well. That customer’s neighbour, Pat, became interested in the shed as it was being installed. He was impressed with both its sturdiness and the efficiency with which it was erected. So, when the time came for him to replace an old plastic shed unit that was in poor condition, he contacted us to order a Steeltech Shed for himself too. Pat opted for a 6 metre by 3 metre unit, and he has grand plans for it. He brought electricity from his house to the shed via a cable that was laid in a trench. He plans to use the power to run both a washing machine and chest freezer in the shed. He’s also putting in a dedicated workbench, and some free-standing shelving. When we last saw him, he was busy putting in lighting, multiple sockets, and alarm sensors. We hope to return in a few months to see the shed fully kitted out. 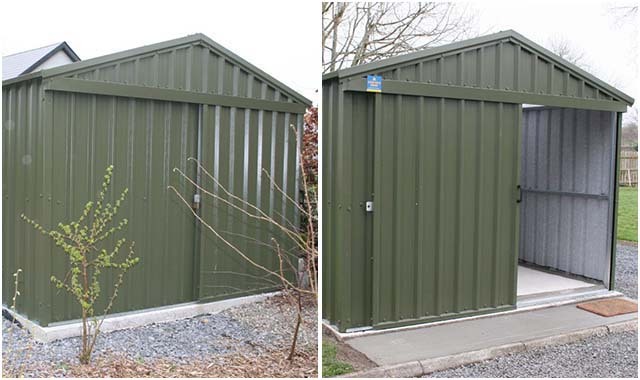 These two Steeltech Sheds installations show the versatility that Steeltech Sheds offer. Whether just for general storage, or whether for a purpose such as a workshop or to take the appliances that won’t fit well in your utility room or kitchen, Steeltech Sheds are the perfect solutions. These two neighbours now know that for themselves. Talk to us to learn more about what we can do for you too! 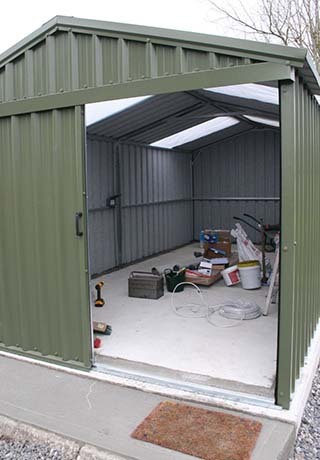 We can design and deliver Steeltech Sheds for installation all over Ireland. Whether you need storage space, a workshop, a home office, a garden room, or anything else, let us bring the perfect solution to you. Just contact us to get things started!